PicoScope 9404-05 is the first of a new class of oscilloscopes that combine the benefits of real-time sampling, equivalent-time sampling and high analog bandwidth. The PicoScope 9404-05 has four 5 GHz input channels with market-leading ADC, timing and display resolutions for accurately measuring and visualizing high-speed analog and data signals. It is ideal for capturing pulse and step transitions to 70 ps, impulses down to 140 ps and clocks and data eyes to 3 Gb/s. Most high-bandwidth applications involve repetitive signals or clock-related data streams that can be readily analyzed by equivalent-time sampling (ETS). The SXRTO is fast: it quickly builds ETS, persistence displays and statistics with up to 2 million triggered captures per second. 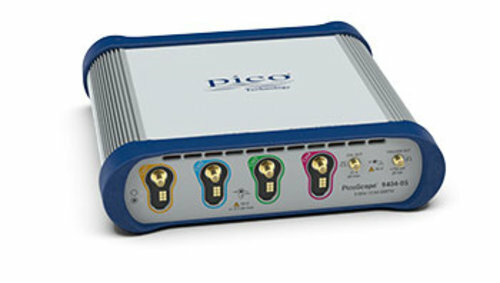 The PicoScope 9404-05 has a built-in full-bandwidth trigger on every channel, with pretrigger ETS capture to well above the Nyquist sampling rate. There are three acquisition modes—real time, ETS and roll—all capturing at 12-bit resolution into a shared memory of 250 kS. The PicoSample 4 software is derived from our existing PicoSample 3 and PicoScope 9000 products, which together represent over ten years of development, customer feedback and optimization. The high-resolution display can be resized to fit any window, filling 4k and even larger monitors or arrays of monitors. Four independent zoom channels can show you different views of your data down to a resolution of 1 ps. Most of the controls and status panels can be shown or hidden according to your application, allowing you to make optimal use of the display area. The oscilloscope has a 2.5 GHz direct trigger that can be driven from any input channel, and a built-in prescaler can extend the trigger bandwidth to 5 GHz.